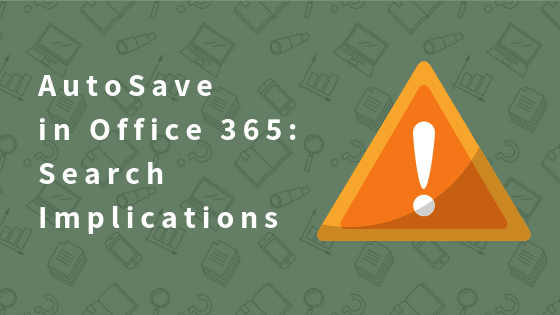 If connected to Office 365, Office applications provide a solution: AutoSave to the rescue! We also have AutoSave by default if opening Office documents in a browser. When AutoSave is on, even an unintended Space or Enter can activate it. Reading a document, you accidentally hit a key on the keyboard – and boom, instantly you are the “Modified by”, and the “Last Modified” time will be updated, too. It raises a few questions: as an organization, do you really want this? Do you want the documents being accidentally “modified” when someone opens them for reading only? Do you want an ever-changing “modified by” property on your content? Do you also want it on “frozen” documents, which are not intended to be updated anymore but still are editable? Users like to filter for documents by its latest editor, or the last modified date. Moreover, many organizations filter for “recent” content on search-driven pages, which might bring up “old” but “accidentally modified” now. Another consideration is the signals you send to the Microsoft Graph. While reading a document is a private action (others cannot discover you’ve read that content), modifying a document is public (others will see that document on your profile). It might sound not that critical first, but consider what if you’re just reading the Leave Policy document of your company… if you don’t modify it at all, it is a read signal that is being sent to the Microsoft Graph, therefore it is a private relationship between you and the document. Your manager (or colleagues) cannot find out you are considering to leave the company. While the idea behind the AutoSave function makes sense, it might have drawbacks, too. Always consider if your users and organization’s culture are ready for it – and don’t forget to educate them if you decide to keep it turned on. I think the issue has also to do with the way MS Graph logic will interpret a read-situation as a edit-situation which will clutter and confuse the whole logic of “what are my colleagues working on..?” concept as presented in for instance Delve.